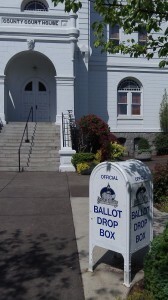 Ballot drop boxes like this in Corvallis are not exactly being overrun. If we want more citizens to vote, we’ll have to make elections interesting. Oregon elections sometimes are, but in most respects this primary is not. What can we do? Have hot issues on the statewide ballot. Except for some local issues — Jackson’s County’s GMO ban comes to mind — we have no controversial initiatives on the ballot other than local money issues. No wonder many voters could not care less. Also, most candidates are running unopposed. The one important exception is the Republican nomination for U.S. Senate, with two main contenders and three others. But Republicans are a small minority of all registered voters, so most people with ballots can’t vote in the only interesting statewide race. That could be fixed by adopting an open primary, but the politicians and their parties opposed that reform and the voters rejected it a few years ago. Someone answering Brown’s Facebook plea made this point. Most people, she claimed, no longer read their mail. So they might just throw away the ballots along with the junk. If that’s so and becomes widespread, voting by mail is doomed, and pretty soon people will demand to vote the way they shop and pay their bills — online. Until that frightful day comes, let’s quit worrying about voter turnout. If there’s an exciting election, people will want to vote without being hectored. And if elections are boring, voters are right to ignore them. Being a now “non-aligned” voter this democracy is a charade in my opinion. The powers in office don’t want an open primary where any & all candidates can run & I could vote on them. Gracious, just think of it, Maybe a candidate would get the vote who didn’t have to walk/talk the “party line”. That would dilute political power. So we go into 4 & 8 year cycles of political stagnation. I agree. More voting isn’t necessarily better voting. I’d rather have a low turnout of well-informed voters than a high turnout of flaky voters. Essentially, that is what we have in Albany given the last two or three local elections. A turnout of about 35% is the most we can expect on hot local issues. I’ve often wondered WHY does the Secretary of State take such extraneous means to get people to register? Is it in their job duties? I would like to see where that is spelled out. The only reason I can think of is the same as any other state department, commission etc. GENERATE MORE STATE JOBS! There’s “power” in numbers! Look at DHS and the various agencies related to the court/prison system. Seems a bit ironic that they both seem to work together to have the fastest growth! Regarding internet-based voting. I expect that it will come some day, but I will fight it til I die. There would be absolutely no paper trail, no way to audit the system in a way that could not be evaded by smart programmers. I would lose confidence in our voting system at that point. With vote-by-mail, or other systems which involve a paper trail, it is possible to verify any election. Regarding higher turnout, I agree it’s not much of a problem. However, I’m inclined to believe that it were an event like it used to be, with voters voting in person, that turn out would tick up a bit. As I recall, vote by mail drove up the numbers temporarily, due to the novelty of the procedure, but it seems to have dropped back down. One of the selling points for vote by mail was to increase voter turn out. I expect that that will be used as a selling point for internet voting in the future as well, especially for those who software vendors who expect to profit by such a switch. In disclosure, I am a software developer, and have been for 30 years now.